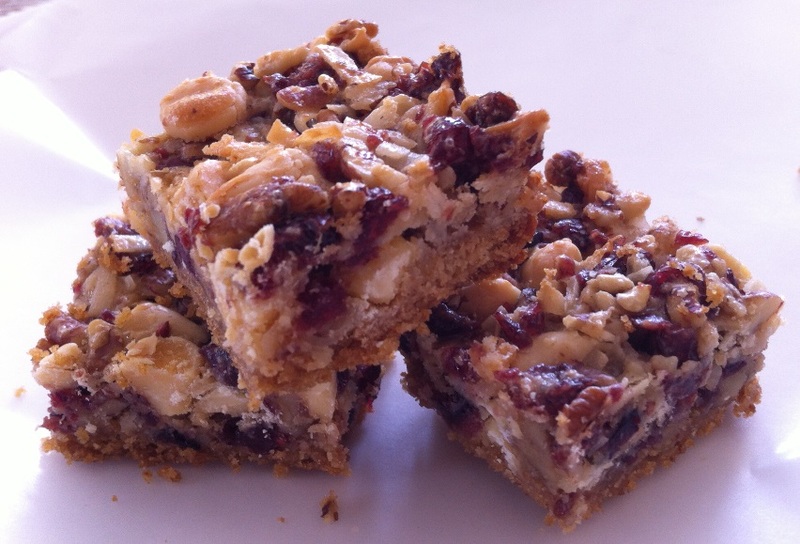 These Christmas Cookie Bars combine two holiday colors white and red to evoke symbols of the season. White chocolate chips and coconut resemble snow, dried cranberries resemble holly berries, and pecans round out this flavorful ingredient combination, adding a festive look to your Christmas cookie platter. 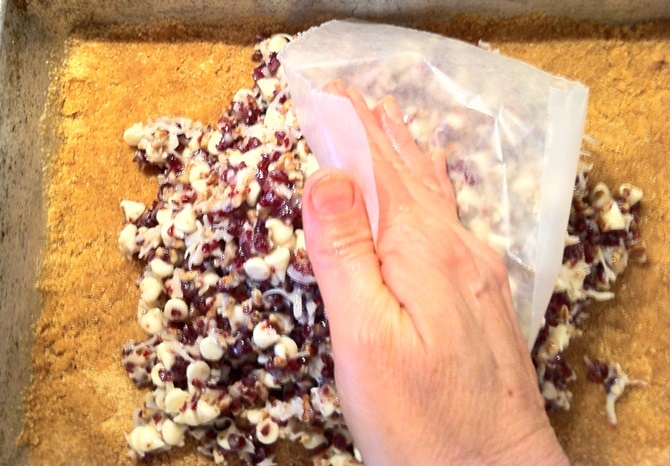 Place dried cranberries in a food processor. Pulse with steel blade until moderately chopped. Add in pecans and pulse the berries and nuts together until the texture is well minced. In a medium sized bowl with a large spoon, mix together white chocolate chips, chopped cranberry mixture, and coconut. Pour sweetened condensed milk evenly over mixture. Mix together until chocolate, fruit, and nuts are thoroughly coated. Spoon fruit and nut mixture over graham cracker crust. Press down evenly with a wooden spoon or a piece of waxed paper. Bake bars 25-28 minutes until lightly browned. Remove the pan from the oven and allow it to cool completely on a wire rack. Cut into bars. If you prefer your barsto have a chunkier surface texture, you can combine cranberries and chopped pecans directly with the white chocolate chips and coconut without mincing them first in the food processor. Chopping creates a smoother texture on the cookie surface.